Chiang Mai is the second largest city in Thailand, roughly one-tenth the size and population of Bangkok. Located an hour’s flight north of Bangkok, Chiang Mai is nestled in a valley surrounded by low mountains. Temperatures this time of year are similar to Bangkok’s, but a little less humid and ever so slightly cooler at night. We lucked out that our visit coincided with a bit of a cool spell, with temperatures about 28 degrees (82 F) during the day and 24 degrees (74 C) at night. The weather was overcast most days with light drizzle, so we were spared the harsh sun. At the heart of Chiang Mai is the old city, delineated by a moat and the ruins of city walls shaped in an approximately 1.5 km square. The eastern portion of the old city, near Tha Phae gate, is more of the touristy area. Our hotel, the Tamarind Village, was a few blocks west of that. 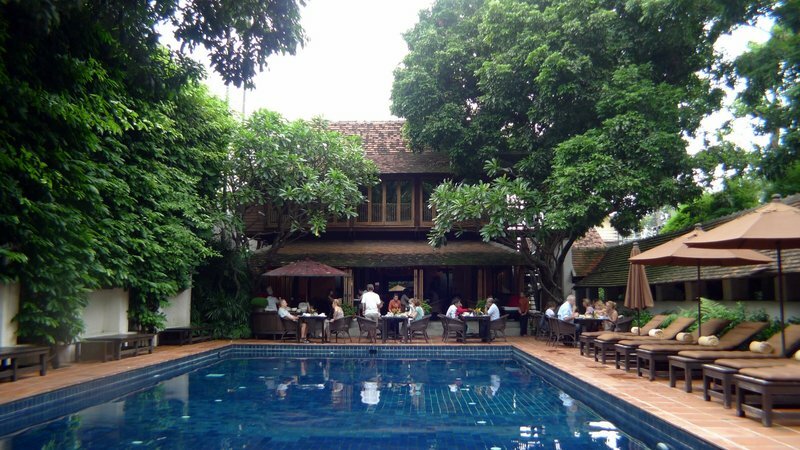 The hotel is named after the 200-year old tamarind tree, pictured above, that shades one of the courtyards. Set back from the main street by a long, bamboo-shaded driveway, Tamarind Village fits the cliche of an “urban oasis” and is surprisingly quiet and calm. The buildings are laid out in a series of courtyards, each of which is very lush. The rooms are somewhat rustic, with simple interiors, and the staff are extremely friendly and helpful. There are only 43 rooms and, despite it being low season, the hotel was fully booked. Many of the tourists were European with a large number of French families visiting. The restaurant next to the pool serves a complimentary breakfast buffet each morning with both indoor and outdoor seating. It was a nice place to relax but I can’t spend too long cooped up in one place so headed out to explore. Outside our hotel and just down the block is a busy corner with a Wawee Coffee. 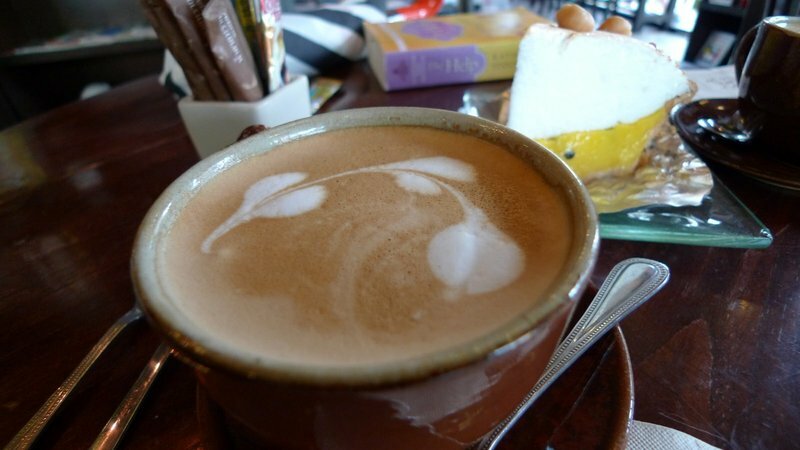 Wawee is a Chiang Mai based chain that offers very tasty coffee. I made a few stops there over our vacation and enjoyed lingering and watching the people pass. The customers were almost exclusively tourists, which left me feeling itchy, but they also provided several interesting people watching episodes. 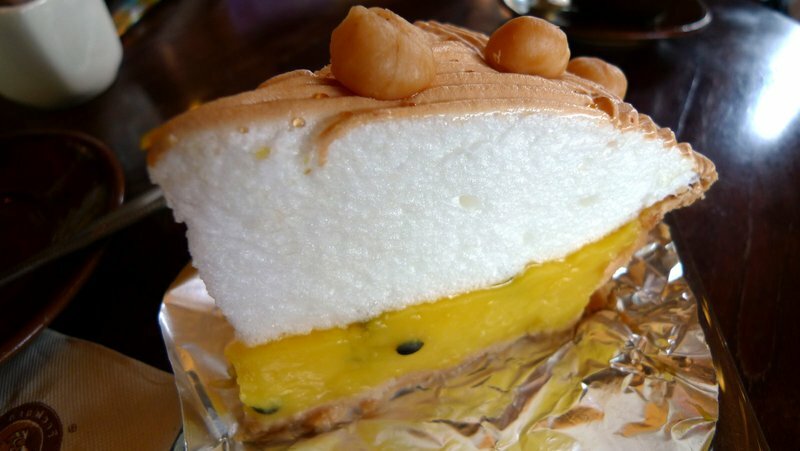 Passionfruit meringue pie. Oh, this was very good! The intersection at which the Wawee Coffee sits is a microcosm of Chiang Mai or, at least, the touristy part of Chiang Mai. Let’s talk about what you can see at this corner. This corner seemed to be a magnet for the lost and disoriented travelers. As I sat there, I saw group after group stop at the corner and struggle with their Lonely Planet guidebook or maps, puzzling over the directions, and then head off down the street. Sure enough, a few minutes later they would come back, evaluate their books or maps again, and head off in another direction. 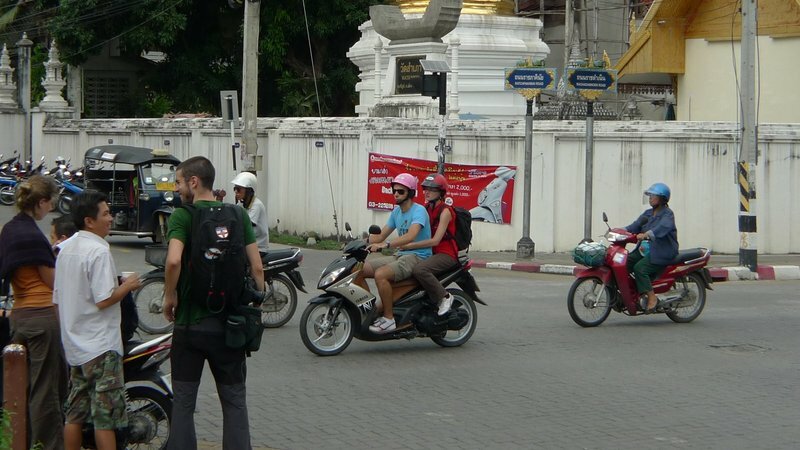 At this corner, a Thai man (in camo shorts) was speaking with lost tourists. He speaks proficient English and asks the tourists where they are going. He gives them directions and then suggests they take a tuk-tuk (the three wheel vehicle in the background), which of course is conveniently waiting. It is conveniently overpriced, too. Another thing you can see in this picture is a pair of foreigners on a rented motorbike. So many tourists rent bicycles and motorbikes in Chiang Mai. I have to wonder how many accidents there are. As I drove about town, I watched as tourists rode either dangerously fast or dangerously unaware of traffic around them. Thai drivers are aggressive and the streets in the old city are narrow. Not much room for foolish and inexperienced tourists. 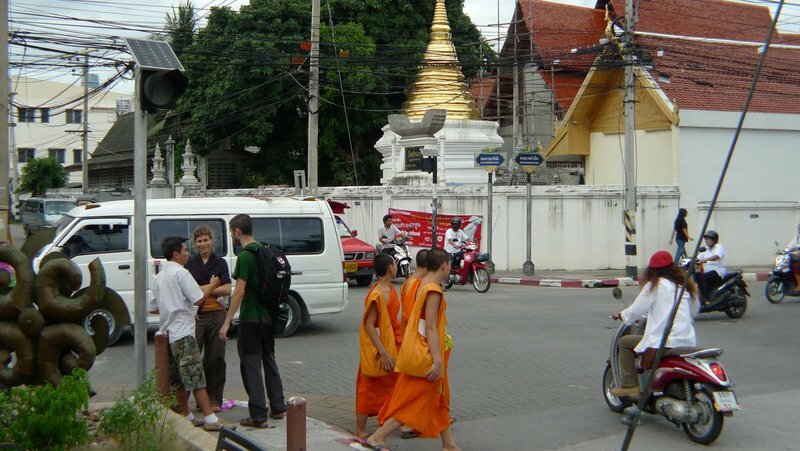 Two other common sights in Chiang Mai are shown in this picture. First, the yellow (actually, usually red) pickup truck with covered seating in the back, which are called “song taews”. The name means “two rows” and refers to the two benches in the back of the truck. These are used something like taxis in that they don’t usually operate a fixed route. You flag one down (it may or may not have a sign indicating where it is heading) and name your destination. If the song taew is heading that general direction, you can hop on, otherwise the driver will wave you off. Fares are negotiated but are usually inexpensive. It is initially a little complicated but ends up being a pretty effective way to get about. The second common sight is the side-saddle female passengers on the motorbikes. You see this throughout Thailand and I’m always startled by how effectively these ladies manage to balance themselves. The final common sight are monks. Chiang Mai is home to two monastic universities and scores of temples and you see a greater concentration of monks and novices here than anyplace else in Thailand. A snapshot of Chiang Mai would be incomplete without some saffron robes in it! More about monks in Chiang Mai in the next entry. This entry was posted in Uncategorized and tagged Chiang Mai, Monk, Tamarind Village, Thailand, Tourist, travel by christao408. Bookmark the permalink. The bamboo driveway looks quite cool. Chiang Mai has to “struggle” with an explosion of tourism and motor cars, I suppose? Looking forward to those beautiful temples…. Life of the two traveling dudes continues to the far reaching corners of the world. Not even Marco Polo was so lucky. Seems like a perfect getaway! P.S: Love the red (Asian) umbrella! @The_Eyes_Of_A_Painter – It is a matter of perspective. For someone in Bangkok, Chiang Mai is not really a “far corner” at all! 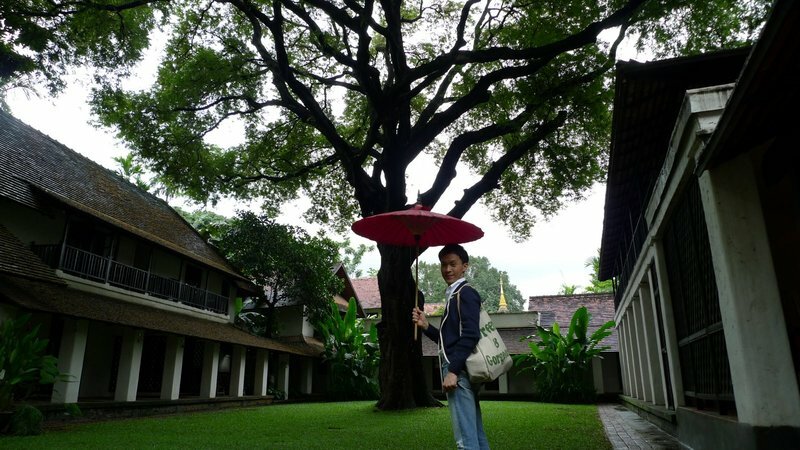 @Dezinerdreams – Oh, that was actually the hotel’s umbrella! =D@CurryPuffy – If you get outside the old city, Chiang Mai is sprawling like just about anywhere else. On a future visit I’m going to rent a bicycle and explore a bit. It does look like a nice getaway. As usual you found another. It looks like a lovely place to stay! I visited Thailand a couple summers back and only stayed for 4 days. I loved the culture and the food though. Eat lots! So peaceful and charming. I agree with you about the way the ladies side-saddle female passengers. Same thing in India, and they have babies in their arms. Unbelievable! I’ve seen canopy streets before, but not bamboo canopies. I was amused seeing 3, 4 or more people on the motorcycles and motorcycle taxis. A co-worker returned to visit Cambodia, where he was from. He told me about the pickup truck loaded with passengers, inside and out. On top of the pickup bed was a rack holding two motorcycles. On top of the two motorcycles were four other passengers. Having been a telephone installer many years ago, I was also fascinated by the amount of overhead wires in Thailand. I’m reading the fact sheet on the hotel’s website. The building looks familiar but I have no idea what it used to be before. Mind you, it’s been a long time since I’ve walked along that road. I usually stayed at hotels / cheap accommodations by Thae Pae gate. I think Chiang Mai has always struggled trying to remain small while handling the growing population of tourists and locals. I’m pretty sure I got lost in that intersection with my Lonely Planet guide too. I do remember someone wanting to sell me jewelry (the usual scam) as well. 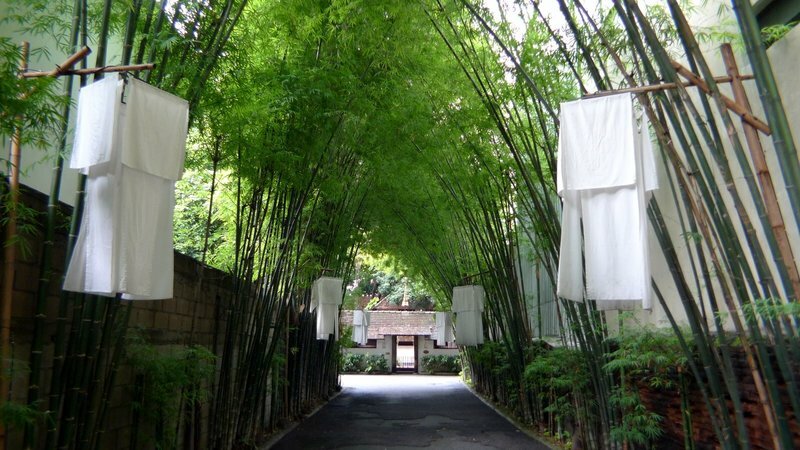 I love the photo of the bamboo covered drive – very beautiful. Sounds like restful accommodations and enough time to relax. I think I’d pass on a motor bike and definitely riding “side saddle” for fear I’d fall off and be run over! I have always wanted to sit on the side on a motorbike like that lady. Somehow I feel that it is rather romantic. Love the bamboos so much. Trying to plant them here, it’s working out nothing like that!